Warblers are among the most challenging birds to identify. They exhibit an array of seasonal plumages and have distinctive yet oft-confused calls and songs. 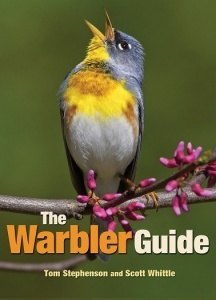 The Warbler Guide enables you to quickly identify any of the 56 species of warblers in the United States and Canada. This groundbreaking guide features more than 1,000 stunning color photos, extensive species accounts with multiple viewing angles, and an entirely new system of vocalization analysis that helps you distinguish songs and calls. The Warbler Guide revolutionizes birdwatching, making warbler identification easier than ever before. For more information, please see the author videos on the Princeton University Press website. Tom Stephenson’s articles and photos have appeared in Birding and Bird Watcher’s Digest, at Surfbirds.com, and in the Handbook of the Birds of the World. He has guided groups across the United States and Asia. A musician, he has had several Grammy and Academy Award winners as clients, and was director of technology at Roland Corporation. Scott Whittle lives in Cape May, New Jersey, and has twenty years of experience as a professional photographer and educator. He holds an MFA in photography from the School of Visual Arts in New York, is a fellow of the MacDowell Colony, and is a onetime New York State Big Year record holder.